What are The Best Outdoor Toys for Kids to Play in the Summer? What are the Best Outdoor Toy Ideas for Children to Play in The Summer? Are you looking for the best outdoor summer toys for kids out there? When we think about summer, being outdoors and children, one of the first things we think of is WATER! So of course the best outdoor toys for kids to play during summer will involve them getting soaking wet! That’s why fun water sprinklers, inflatable pools and water slides are among the most bought toys for the summer. Kids also love to bounce, ride, swing and slide, so a cool outdoor trampoline or inflatable bounce house and a fun swing set are also great options! On this page I put together a few of the best outdoor toy ideas for children ages 2 to about 10 years old! I think you are going to like these fun summer toys and I am sure you are going to find something for your children here! 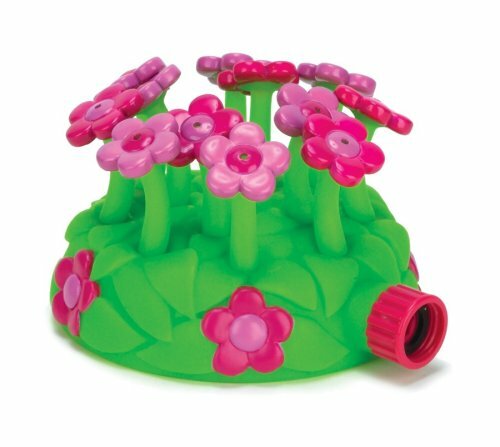 Cute and FUN Water Sprinkler Toys! Best Outdoor Summer Toy Idea for Children Ages 2 to 5 Years Old! If you’ve got little ones under the age 6 at home and it’s hot inside, then why not get them a cute and fun water sprinkler toy? Toddlers and small children LOVE to play in the water, we all know that, and a fun water sprinkler is not only a cheap option, but also a safe one! They are perfect for people who have very small backyards that wouldn’t fit a pool. Get a couple of cute water sprinklers set up and watch your kids have the time of their lives running through the water coming out! 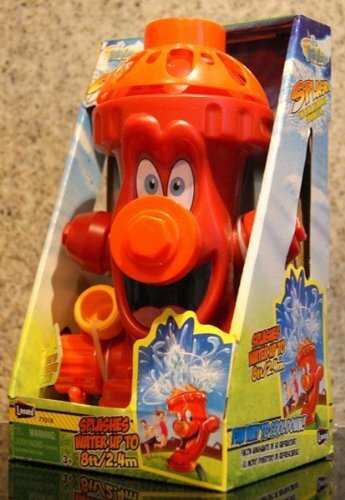 This fire hydrant hose sprinkler is not only ultra CUTE and extra-smiley, but also loads of FUN! He will spin and spray water like crazy, all over the place! Just attach ‘him’ to any garden hose! Of course a fun and colorful inflatable kiddie pool is also a great summer toy idea for small children too! They love to be in the water, specially when is ultra-HOT outside! 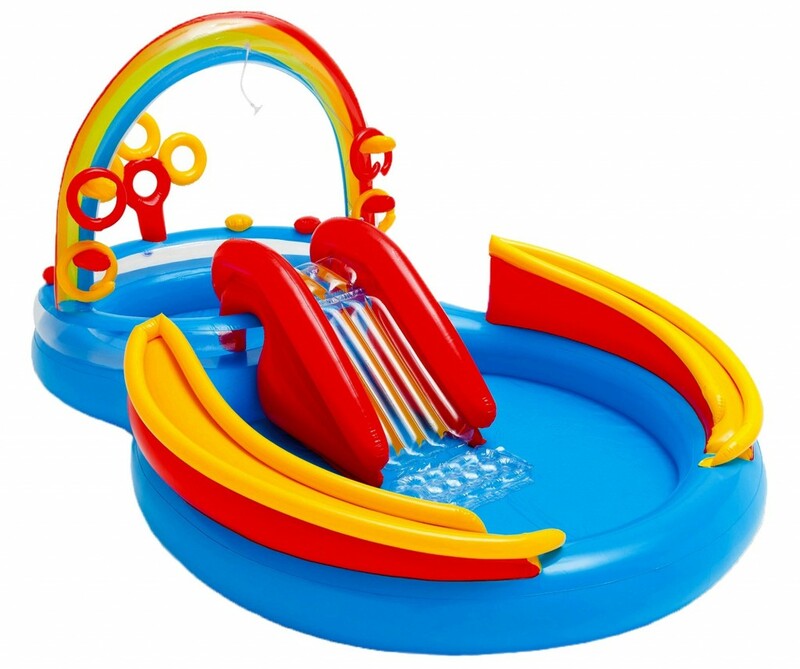 This is a very cool RAINBOW pool with a slide and a ring toss game for small kids ages 2 to about 5 or 6 years old! It will fit 2 or 3 kids playing inside at the same time. Best Inflatable Swimming Pool for Toddlers! 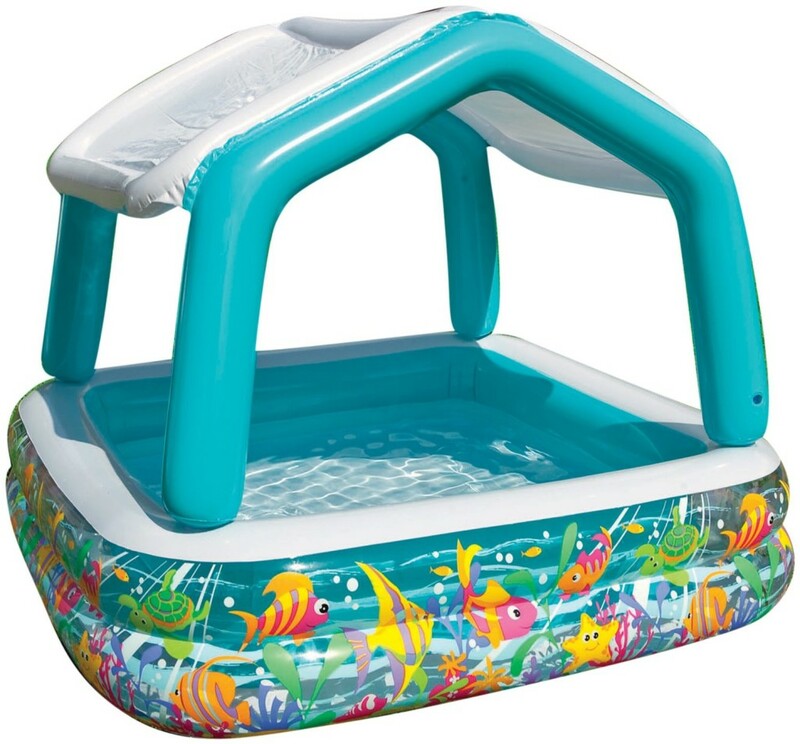 This is a great and very cute inflatable swimming pool with sun shade that fits about 3 toddlers playing inside! Cool Inflatable Water Park: Awesome Outdoor Toy Idea for Kids Ages 3 to 10 Years Old! If you have a little more space in your backyard and are looking for something to keep the kids occupied while the parents have a nice barbecue, than I strongly recommend getting a cool inflatable water park, just like the one you see on this picture! It fits up to 6 kids playing together! Perfect to keep them entertained on fun family gatherings! 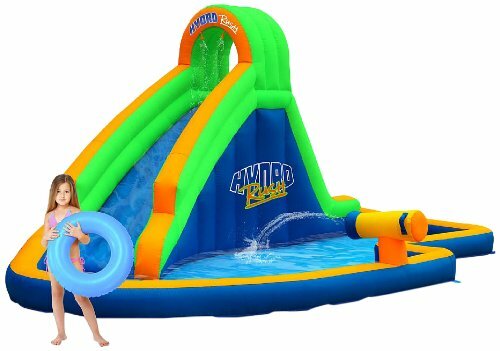 Here are the *BEST INFLATABLE WATER SLIDES FOR THE BACKYARD! If you would rather keep your kids DRY while playing outside, but also happy and active, then why not get them a fun inflatable bounce house? They are also excellent outdoor toy ideas for kids ages 3 to 10 years old! Kids LOVE to bounce and jump inside fun bouncy houses! It fits about 3 or 4 bouncy kids inside! 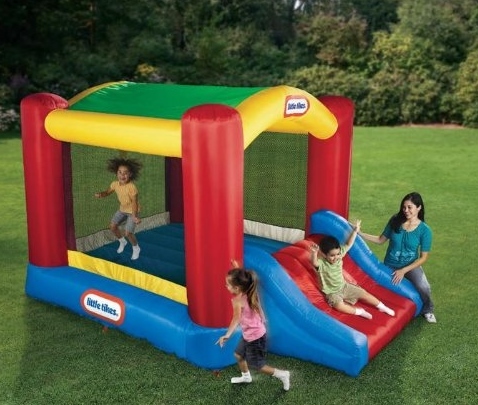 Here are the *BEST INFLATABLE BOUNCY HOUSES FOR KIDS! 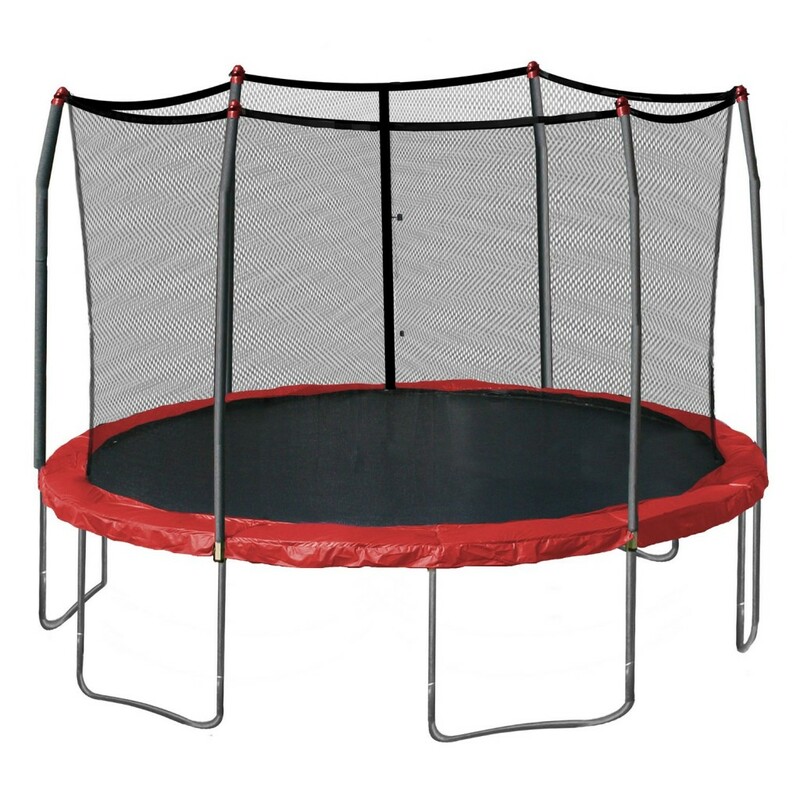 Cool and fun outdoor trampolines are also a great ‘toy’ idea for the older kids! It is an excellent way to make them exercise their muscles while they keep fit! I love this red one! It is a very nice trampoline! Great for birthday parties too! How about a Fun Climber for the Kids? 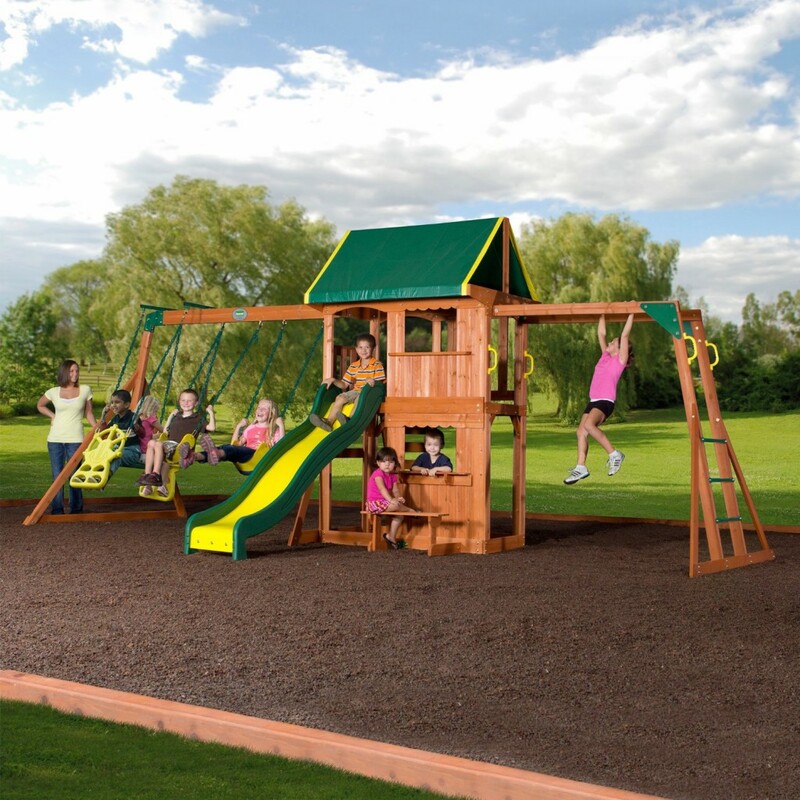 Climbing toys and structures are also absolutely PERFECT to have in the backyard for the summer! It makes kids exercise and improves their balance and coordination skills while they have a blast! They are also perfect for several kids playing together! 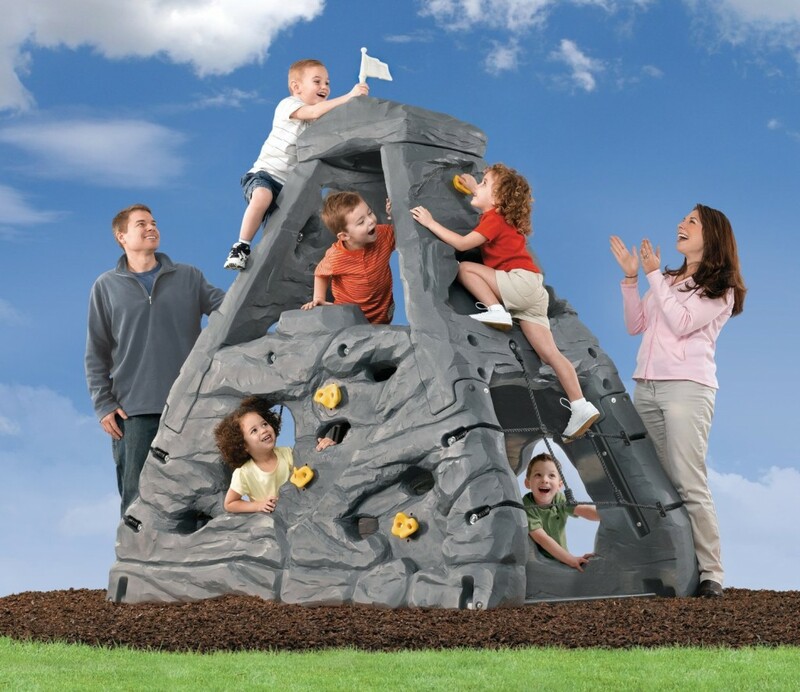 This is a great climbing structure for kids ages 3 to about 7 or 8 years old! Here are the *BEST CLIMBERS FOR KIDS! Awesome Wood Swing Set for Kids! It is THE BEST outdoor toy idea for children ages 3 to 10 years old! Perfect for large family gatherings, birthdays or barbecues! The kids are kept busy and entertained while the parents can relax and chit chat too! It is fairly large and it fits about 8 kids at the same time! Here are the *BEST SWING SETS FOR THE BACKYARD! Great Backyard Toy Idea for Kids! When I was little one of the best outdoor toys for me was the teeter totter! I had the time of my life playing on them! Nowadays there are so many fun options around! 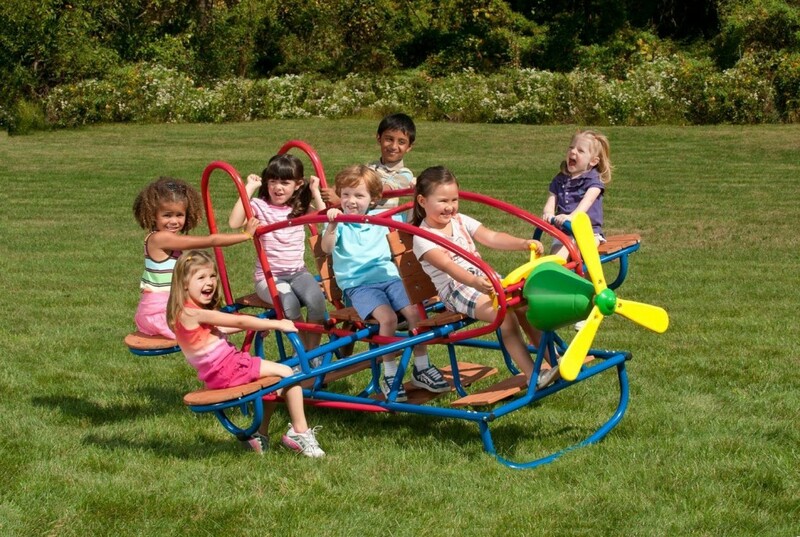 This is a fun and colorful airplane teeter totter that fits 7 children at the same time! Perfect for kids ages 3 to 10 years old! Fun Playhouses for the Backyard! A cute and fun playhouse is also a GREAT toy idea for the backyard! It is perfect for the little ones to play ‘house’! They love to open and close the doors and the windows and use their imaginations! 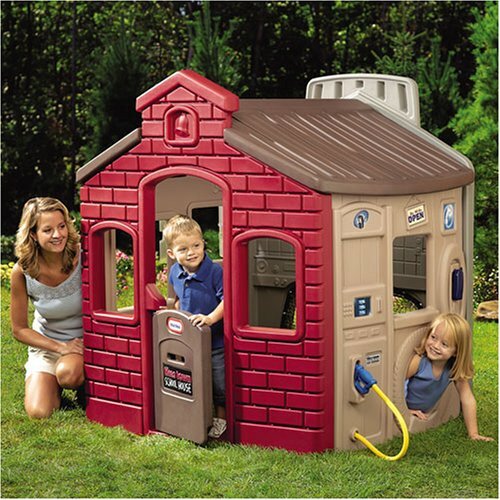 Parents love this Little Tikes Town playhouse! It is full of fun activities and it looks great! Here are the *BEST PLAYHOUSES FOR TODDLERS! And last, but not least, you can never go wrong by buying cool and fun riding toys for the kids! They LOVE to ride cool cars, scooters, bikes and tractors! 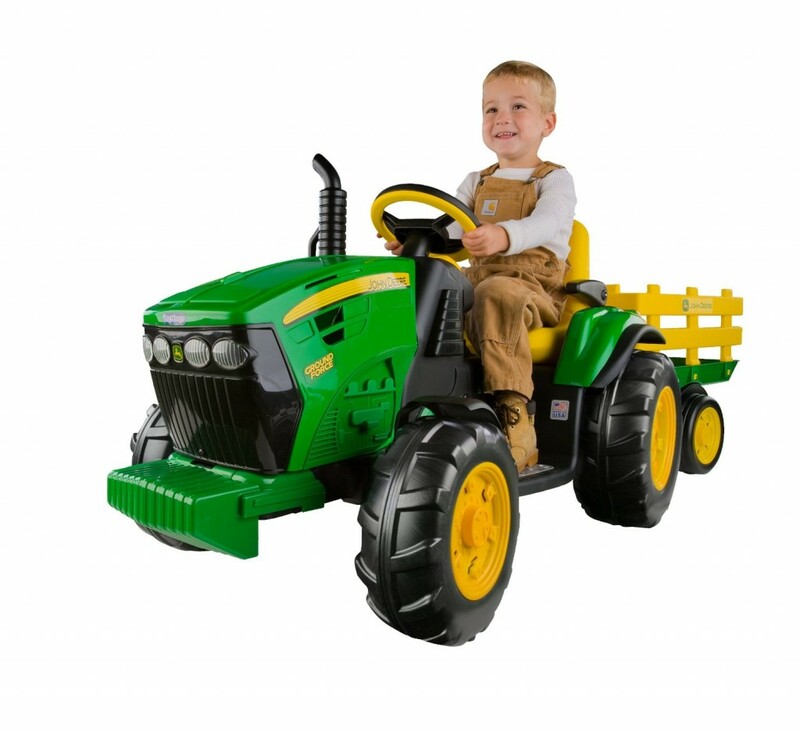 The riding toy is actually one of the very first toys parents buy for their toddlers! Here are the *BEST RIDE ON TOYS FOR KIDS!